Finding a winning t-shirt idea to create for Merch by Amazon is easier than you may have imagined. With the right tools and resources in place you can quickly come up with t-shirt ideas that you know have a great chance of selling before you ever create them. In this guide I’ll show you how to quickly find winning t-shirt ideas, check them for trademark safety, how to find free vector graphics to complement your idea, and ultimately how to quickly create a t-shirt design in less than 10 minutes that you can upload to Merch by Amazon. In order to be successful on Merch by Amazon you need to hone in on your research skills, and understand how to conduct product and market research properly. Finding a good niche and t-shirt idea is the most important aspect of product research. The ideal goal while doing product research is to uncover niches with high demand, and low competition. 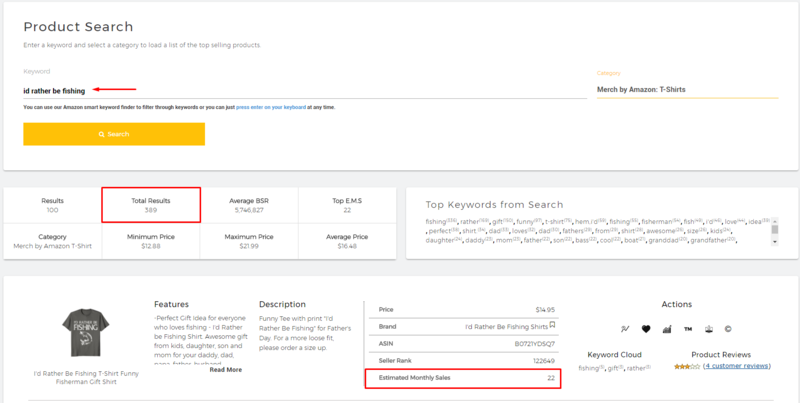 Our Product Search module makes this process easy, and it gives you access to monthly sales estimates of each product, most used keywords from your product search, historical price and sales data, reviews, top selling products, and so much more. If you don’t have a Merch Titans membership yet, I recommend you take a few minutes to sign up for our 7-day free trial in order to take full advantage of this guide before we start. If you can’t afford a membership you can always use our free (but limited) product research tool here. Now, let’s find a winning t-shirt idea for Merch by Amazon. Our Product Search tool pulls the best sellers from Amazon for any keyword you enter and sorts them for you in an easily readable manner so that you can quickly find ideas with potential. I recommend you start your product research process on Merch Titans by typing in simple keywords for a topic you may be interested in or have experience in. For me, I’ll use Fishing in this example, and search until I find a sub-niche, and idea that is worth pursuing. I start my research process by using Product Search inside Merch Titans. You can find this module here. I’ll start by searching “fishing shirt” to get my creative juices flowing, and to gauge the market. As you can see this is a highly competitive niche with 29,000+ results on Amazon. The next step is to scroll through all the results on Product Search, and see what type of shirts stand out, check the keywords they’re using, and start digging deeper (niching down). Right off the reel I see a couple of simple “Here Fishy Fishy Fishy” shirts that are receiving an estimate of 30 – 40 sales per month each. It’s worth running a search on this keyword to gauge the competition, and see what exists in the space. As you can see there’s much less competition for the keyword “Here Fishy Fishy Fishy”. You can save this idea to favorites, and use it as a model to make your own unique design later on, or you can keep digging to find ideas and niches with even less competition which I recommend. Ideally, you’ll want to find ideas and niches that have less than 200-400 products (total results), and multiple t-shirts that are selling well. However, it’s great to find niches that have fewer products (total results), and higher estimated monthly sales on multiple products. You really have a winning idea when you find a niche that has less than 100 total results, and multiple products selling over 3+ t-shirts per month on estimate. As I was scrolling through the “Here Fishy Fishy Fishy” search results I found a t-shirt that is selling well that stuck out to me. It uses the keyword and phrase “I’d Rather Be Fishing”. I ran a search on “I’d Rather Be Fishing” and here are the results. You can’t see this in the image above, but as I scroll through the returned search results I see there are several t-shirts that are receiving consistent sales each month. The data on this idea and niche looks good. The t-shirts that are selling are simple designs, and I feel I can create a unique design that will sell. I’m going to use this idea as a model for my own design. The next step is to run a trademark check on this phrase and make sure it’s okay to use. Now that we have an idea for a t-shirt “I’d Rather Be Fishing”, we can run a trademark check on the phrase to make sure it’s okay to use. This is a very simple, but necessary step to do on every single t-shirt idea before you ever take any time to create it. There are various websites that you can use to run a trademark check. 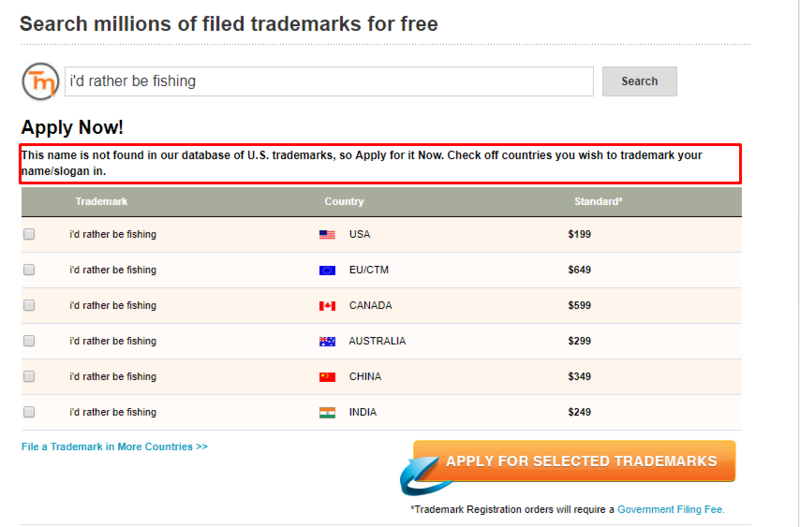 I personally use our free tool here, Trademarkia, TMHunt, and of course the official USPTO TESS search. As you can see from Trademarkia this phrase is not trademarked, and it’s okay to use. We now have a winning t-shirt idea that we know has potential to sell, and it’s clear of trademarks… The next step is to create the design, but first we’re going to need to look for some vector graphics to complement our design. There are multiple websites on the internet that you can use to find free vector graphics. However, this can be a time-consuming process. To make things easier my team and I created a free vector graphics search tool here on Merch Titans that pulls images (free and paid) from multiple sources on the internet to save you time and convenience. 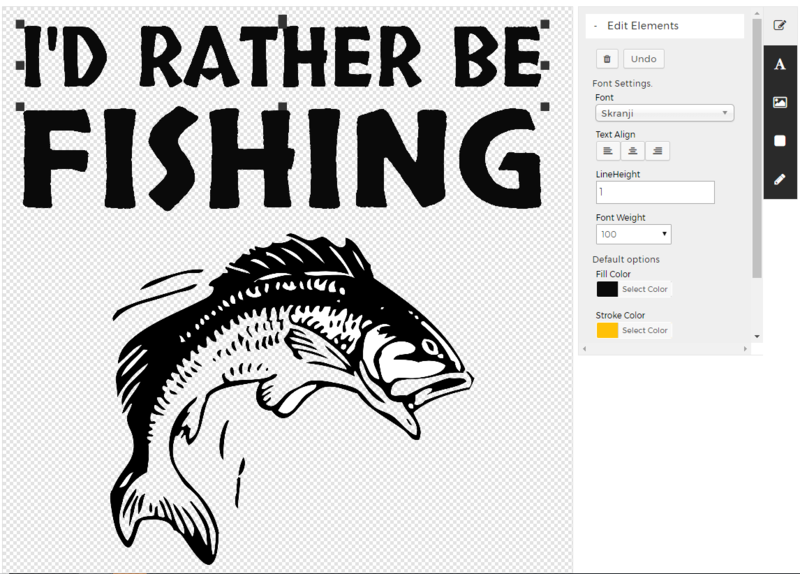 We’ll use that tool to find free vector graphics to use on our “I’d Rather Be Fishing” t-shirt design idea. You can find the search tool here. 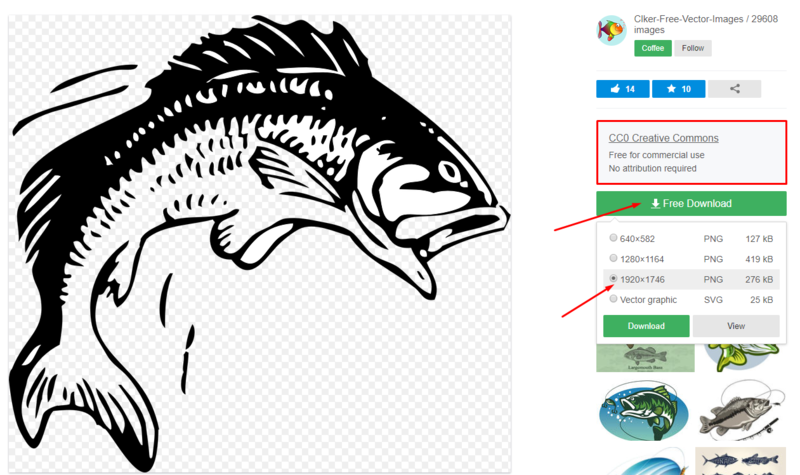 You’ll want to run a basic “fishing” search to see what type of free graphics come up. If you don’t find a graphic you feel is fitting start typing in specific fish types. I typed in “trout” and found a graphic I feel will work nicely for this t-shirt idea. Once you find an image you like you’ll want to click on it, go out to the website, make sure it’s commercially okay to use, and then click on the “Free Download” button. A list of image options will appear, click on the “1920 x 1746” or largest PNG option, and then click “Download” as shown in the image below. Click “Download” and place the image on your desktop or in a place that it will be easy to access later. 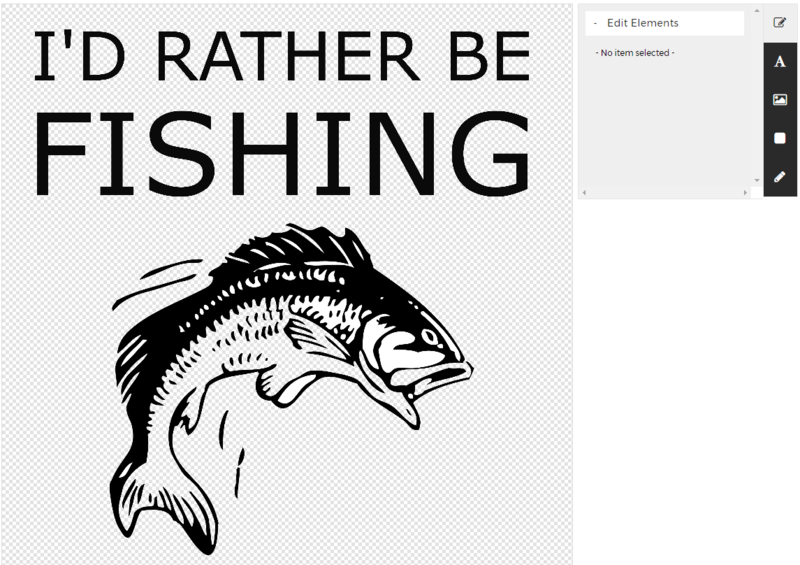 We ran product searches, checked the data, and found a winning t-shirt idea “I’d Rather Be Fishing”. We checked the phrase to make sure it’s not trademarked. We found a free graphic that is commercially okay to use on our t-shirt design. The next step is to create the actual t-shirt design for Merch by Amazon. Creating a good t-shirt design usually requires skill, time, and experience with Photoshop, Illustrator, or Gimp. If you have experience with any photo editing software, I recommend you use it to design your t-shirt. If not, we got you covered with our free t-shirt builder tool. With our free t-shirt builder tool, you don’t have to download and install any software… You can find it here and use it anytime you like. However, it’s not nearly as powerful as Adobe Photoshop or Illustrator, but it can definitely get the job done, and you can quickly create good t-shirt designs that will be optimized for Merch by Amazon when you download them. 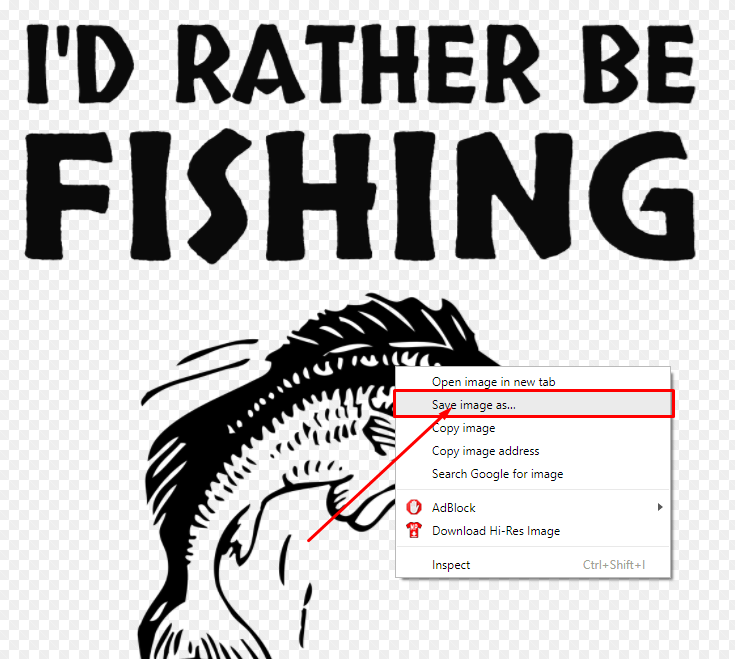 We have our “I’d Rather Be Fishing” idea, and a free graphic to complement it. Now, let’s bring it all together and create a t-shirt design using our free t-shirt builder tool. Our tool gives you quite a few options to get creative. You have access to Google’s massive font library, you can upload PNG and vector files, you can change colors, modify texts, and so much more. I’ll keep things simple for the sake of this guide. In the image below, you can see I quickly added the phrase “I’d Rather Be”, increased its size, and put the font color to black. Now that we have the first text in, I need to finish it up. 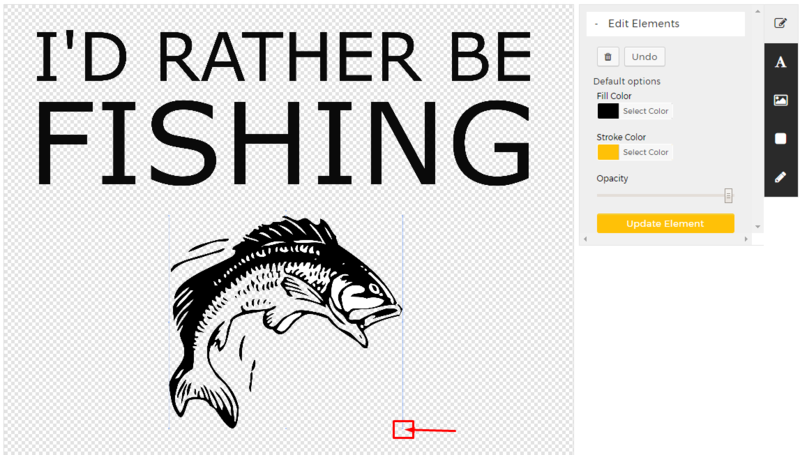 I’m going to add “Fishing” as its own separate layer as shown below. 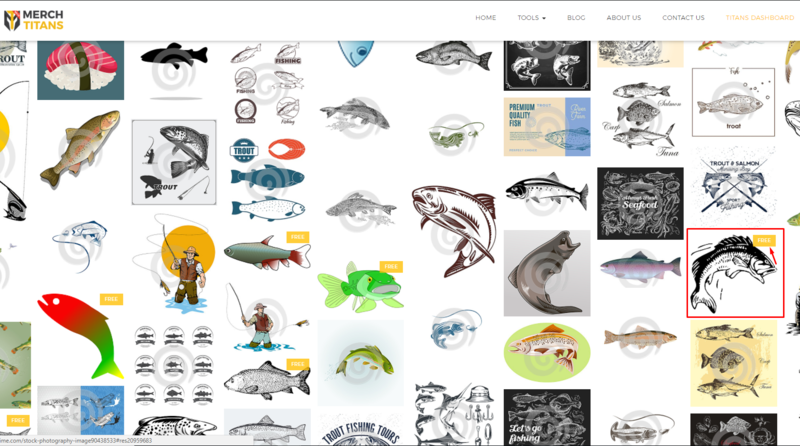 The next step is to upload the fish graphic we found earlier, and add it to our canvas. You can do that by clicking on the “Image” icon in the toolbar section on the right, and then clicking on “Select Image” icon, select the image, and it will upload and then you can click the yellow “Add Image” button to add the image to your canvas. Once the image is added to your canvas you can increase or decrease the size by hovering over the tiny dot in the bottom right corner to select it by clicking and holding in your left mouse button. Everything should scale properly so you won’t pixelate the graphic. In my experience bigger graphics tend to sell better as the “thumbnail” is more visible to a customer that is browsing Amazon. Knowing that, I increased the size of the fish. Here’s what I have now. Everything is coming together nicely. The next step is to make the design look better, and the best way to do that is to change the font type. You can easily adjust font type by clicking on the text inside the canvas, and then clicking on the “Choose a Font” button. You can click on a “text” to adjust the font. 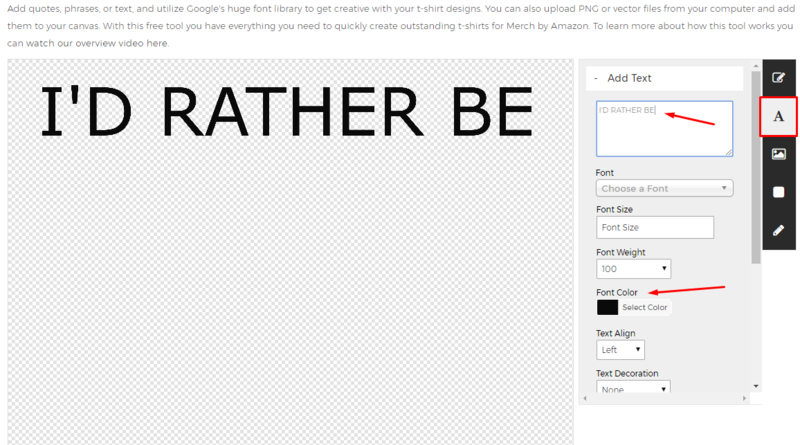 I recommend you look through and test multiple fonts until you find something that is fitting. I found a font I like, and I adjusted both texts to the new font, and here’s what I came up with. This t-shirt design is now complete. The next step is to download it to my computer, and upload it to Merch by Amazon. 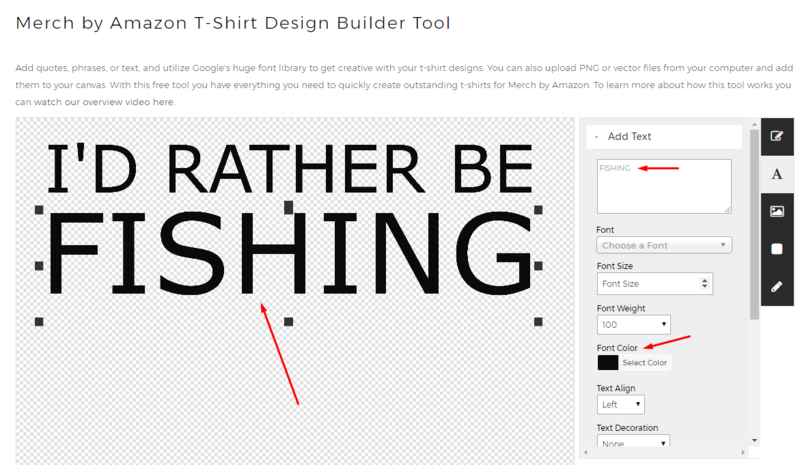 You can download your t-shirt design by click on the yellow “Save” icon at the bottom of the canvas. Once you click the yellow “Save” icon you’ll need to give the tool a few seconds to prepare the image.It will open the image in a new tab when it is ready, and you can Right Click on the image and click “Save Image as” to download it to your computer. Once you have the design saved to your computer you can go ahead and upload it to Merch by Amazon, and any other Print on Demand website such as RedBubble, Teespring, and others. The images from our free t-shirt builder tool are already optimized for Merch by Amazon’s t-shirt design template dimensions (4500px x 5400px) so you’re able to upload them right away without any issues! I hope that opens you up to the creative possibilities of designing for uniqueness. Congrats on making it this far! You should now know how to find a winning t-shirt idea using our product search module, check it for trademark safety, find free graphics to complement your idea, create the t-shirt design, and then upload it to Merch by Amazon. I recommend you take action right away, and repeat this process as many times as needed until you feel you have this method locked down. As with anything, the more you do it, the better you’ll get at it. Take action, and stay consistent! I’m going to build tutorial videos that complement each section of this blog post. Check back often for updates! If you have any questions just let me know in the comments section below. Add a new comment in How To Find & Create A Winning Merch by Amazon T-Shirt Design in Less Than 10 Minutes article.